Initial D World - Discussion Board / Forums -> AE86 vs R32, is it really possible..? I am sure we all remember how Takumi beats Nakazato with his superhuman footwork and fearless move over the curb in First Stage episode 10. One has to wonder, is it really possible..? One Initial D fan sets out to find out. He went to the exact corner where AE86 overtakes the R32 and actually took some measurements. According to him, the gutter is a lot wider than he thought. From the edge of the pavement to the actual curb is a 80 cm (32 inches) of 15° decline. The actual curb is 30 cm (12 inches) in height. He questioned whether or not such shallow dip can generate the centripetal force needed for Takumi's 86 to corner at such speed. In reality, cornering at speed over 100km/h (62mph) at such tight hairpin is probably suicide. The saving grace is, this is going downhill. So the center of gravity is towards the front of the car, meaning the two front tires will have slightly higher traction than the two rear tires. Also, since 86 is relatively light compare to other cars, the inertia is easy on the 86's body. The tendency of the 86 flying out of the gutter due to centrifugal force is minimized. But I digress. Takumi didn't beat Nakazato the same way he did Keisuke. No, Takumi actually drove over the curb, to basically get inside R32's blind spot. As we know, AE86 has a 20cm ride height clearance. In the manga and anime, they never show how exactly the 86 got over the curb. If you ever drive over a curb before, you know it isn't exactly easy on the car. Now imagine driving over a curb at speed in excess of 100km/h. So this is where we draw the line between reality and fantasy. Bottom line, it is possible given the right suspension settings and skill level of the driver, but highly unlikely for just about everyone. 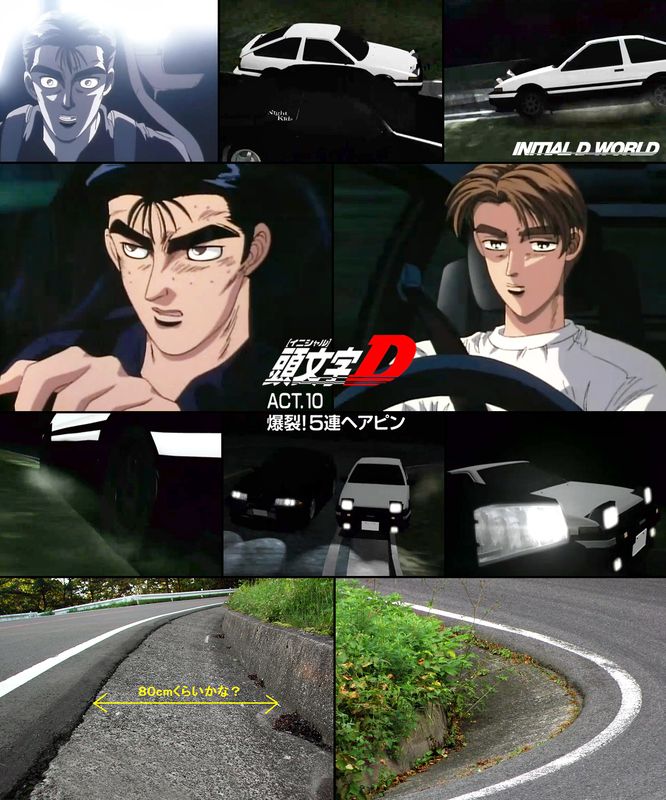 » Screenshots from Initial D First Stage Episode 10「爆裂!5連ヘアピン」"The 5 Consecutive Hairpins"
Image size reduced, original size: 1496 x 1796. Click here to view the image in its original dimension. I'm sure the animators made sure the gutters were the correct width while they were busy smoking joints rolled in American money. Well, didn't Bunta go and fine tune the 86's suspension and other things prior to Takumi facing Nakazato? I'm sure all that meant was that he put a cheat sheet in the driver seat that simply said "wait till his brakes fade".